Rotten veggies? Squishy fruit? We can help! 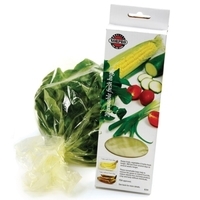 Reusable Fresh Bags keep your produce fresh, vitamin-packed and bacteria free! The bags remove gases from foods and extend their life of food, reduce vitamin loss and inhibit growth of bacteria, mold, decay and fungus. Each bag can be cleaned and reused up to 10 times. Make your money back and then some in reduced waste.